One of the most popular GameCube games arrives on the Nintendo Wii that could be considered the Nintendo version of the "Sims", however more entertaining. 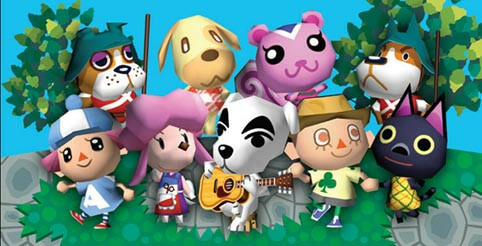 This revival of the Animal Crossing franchise began on the Nintendo DS with Animal Crossing: Wild World and even allows you to move your character from the DS to the Wii version. For those unaware of Animal Crossing, it revolves around "almost" everyday activities as gamers attempt to pay off their mortgage through work, tasks and generally have a great time. The Wii versions is reminiscent of the original, however it has been spruced up and also offers online play which truly where the game takes on a whole new persona. There’s always something new to do. In the living, breathing world of Animal Crossing: City Folk, days and seasons pass in real time, so there’s always something to discover. Catch fireflies in the summer, go trick-or-treating on Halloween or hunt for eggs on Bunny Day. 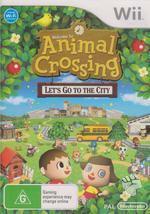 If you’re in the mood for something a little faster paced, take a bus to a new urban city area that’s unique to Animal Crossing: City Folk. There you can catch a show at the theater or check out the sales at Gracie’s boutique. But if you don’t show your face back home for too long, your neighbors will miss you. Up to four people from your household can live and work together to build the perfect town. Design clothes and patterns, write letters and post messages on the bulletin board for each other, or invite up to three friends to visit your town using Nintendo Wi-Fi Connection. With the new WiiSpeak microphone, it’s like you’re all in the same room. The microphone sits atop the sensor bar and picks up the conversation of everyone in the room to encourage a more inclusive experience. Express your personal style. Customize your town, your house and yourself by collecting bugs, fish, fossils, art, furniture, clothes and accessories. You can also go to the salon in the city to change your hairstyle and get a Mii makeover. Plus, if you design clothes in the tailor’s shop, animals will wear them and maybe even bring them to other towns. Before starting the game, you can either import your character from Animal Crossing: Wild World on DS or start from scratch. By starting from scratch, on your way to your new town, a strange little feline character will ask you your name and a few other questions in order to determine your gender. Once your character's name has been established, you need to create the name of your town and finally, your bus arrives in your fresh new city. 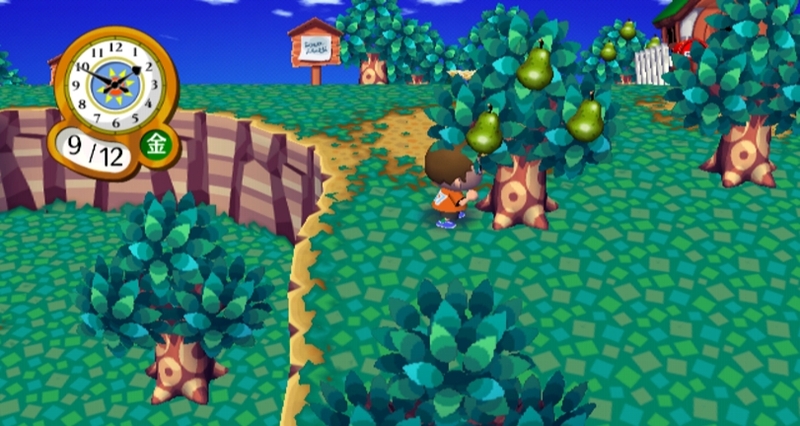 Upon arriving, you need to make your way to the Town Hall where you will be given a map of the town and then asked to meet Nook, the local real-estate agent and shop keep at your proposed new home. At your new home, you will make an agreement with Nook in terms of payment and then you're ready to explore your new city. Interesting enough, I played this game at 11pm at night which meant the majority of stores were closed and the animal citizens of the town were strangely absent. With that said, Animal Crossing on Wii uses the console's internal clock and date that effects the gameplay of the title and with that said, the game uses real-time which is an interesting albeit frustrating concept for someone who works during the day. Thankfully you can "cheat" by setting your Wii's internal clock to the daylight hours, never the less, it's quite an interesting feature. 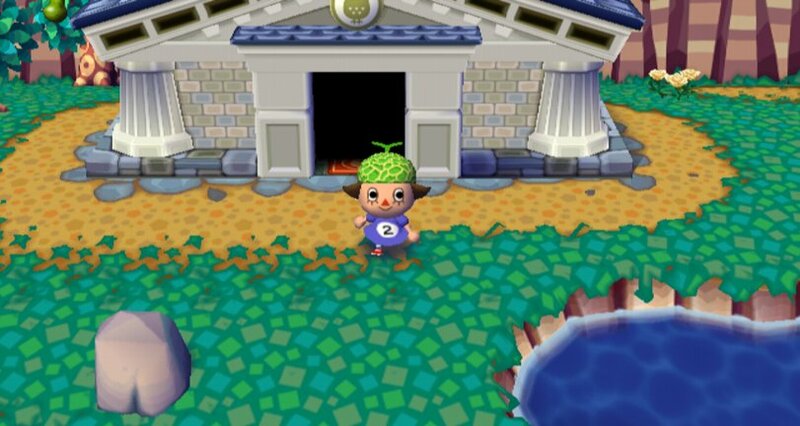 To earn money in Animal Crossing, you need to perform a variety of tasks for the local citizens or purchase items from Nook's store to assist you to make money. For instance, by buying a butterfly net, this will allow you to catch butterflies or by buying a fishing rod, you can then catch fish. In its simplicity, the game is quite unique and actually makes paying off your mortgage a fun activity. The money that you make can also be used to purchase items for your home or new outfits for your characters. In relation to the system clock, this also means that certain items and creatures in the game are seasonal which does leave the game quite open to how long you could play this game. Once your home is paid, Nook quickly comes around and performs some home renovations which makes your home bigger and hence, your loan to Nook starts again. The control system on the Wii is quite innovative and the developers use this unique control system to its advantage, especially when you are trying to catch butterflies or fish. with that said, both controls are used on this game, the Wii remote and the nunchuck as they mimic real-world movements while your character explores. Making friends and talking to animals is a big part of Animal Crossing and by bumping into these folks, they will tell you all sorts of things and some will give you quests to achieve. The conversations are quite comedic at times and does assist in drawing you into this wonderful world of animals living in a city. To keep your relationships strong, you need to write them letters and give them gifts which will assist in the number of friends you have. If you are playing the game online and one of your friends visits, it's quite hilarious when the animals start gossiping of a stranger in the land. The multiplayer aspect of Animal Crossing: City Folk is brilliant and allows you and your friends to visit each other's towns. Match that with the Wii speak microphone and it's almost like you actually in the same room with your friend. The interesting part of the online mode is that all the towns are different that you visit so you will see different items for sale and different plants. Apart from your little "city", you have the option of taking a bus ride to another larger city that allows you spend your earnings and purchase a variety of different items. It's like comparing a country town to a metropolis like Sydney. You can even go to the theatre and perform a variety of other activities which are not available in your home town. Graphically, the title is quite reminiscent of the GameCube version with its cartoon inspired world, filled with animal characters. The best word to sum it up is the game is "cute" that is matched with the gibberish talk of animals and a great MIDI inspired soundtrack. At the end of the day, Animal Crossing will definitely find a new group of gamers who have never played Animal Crossing before. The best part of course is the online play which is thoroughly entertaining. A great game with some new additions from the GameCube version almost makes this its own unique game. Fun from start to finish!